The assurance you need. The price you want. 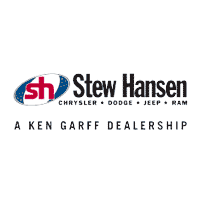 At the dealership you trust – Stew Hansen Dodge. At Stew Hansen Chrysler Dodge Jeep Ram, we’ve made your car buying experience simple by providing you with more selection, a no-nonsense sales team, and a wide variety of new and pre-owned vehicles all with up front prices. An up-to-date Comparison on New or Used Vehicles right here in our community, each vehicle is clearly marked and discounted. Eliminates the negotiation process, thereby saving you time. Best of all, saves you money by giving you the price you want to pay…Up Front. Plus, pre-owned vehicles include a 125 point quality assurance inspection and complete Carfax autobiography report.